The Gowanus Canal. Eagle file photo by Rob Abruzzese. As if the Gowanus Canal did not already have enough junk in its waters, just last week a bulkhead collapsed, sending concrete, wood and other debris into the toxic waterway. The incident occurred on July 26 on private property on Smith Street just south of the Hamilton Bridge. The crumbling was the second to occur since the end of May. The first collapse occurred on public property at 128 Second Ave. near the Lowe’s parking lot by Ninth Street. “It’s really concerning,” Riverkeeper Staff Attorney Sean Dixon told the Brooklyn Eagle. “One part of me wants to know why these are happening in quick succession. These are bulkheads that have been around for a very long time. The majority of the bulkheads along the canal are 50 to 150 years old. The Environmental Protection Agency (EPA) has been in contact with and is providing aid to individual property owners who have contacted the organization about the two collapses and other potential ones. Proprietors are normally held responsible under city regulations for keeping bulkheads in safe conditions. EPA has asked the private property owner’s engineering company to evaluate if further safety or warning steps are needed. “EPA is coordinating with the various state and federal agencies, and has been in contact with the owner and their contractor,” said EPA’s Community Involvement Coordinator Natalie Loney. “Assessment efforts have begun and stabilization measures are expected to begin shortly. It is unclear how these bulkhead collapses will affect the long-term cleanup of the canal, but EPA plans to have all of the bulkheads upgraded before dredging starts on each section of the waterway. A turbidity curtain will be installed shortly, followed by other stabilization measures and an eventual full replacement, EPA Public Information Officer Elias Rodriguez told the Eagle. Rodriguez said that the U.S. Coast Guard plans to publish a Notice to Mariners this week. Langan Engineering is the company responsible for fixing the broken bulkheads. The 100-foot-wide, 1.8-mile noxious canal was declared a Superfund site in 2010. The plan to clean the Gowanus Canal — which is estimated to cost $506 million — includes not only dredging contaminated deposit that has accumulated because of industrial and sewer discharges, but also installing two 8-million-gallon sewage and storm water retention tanks to prevent combined sewer overflow. 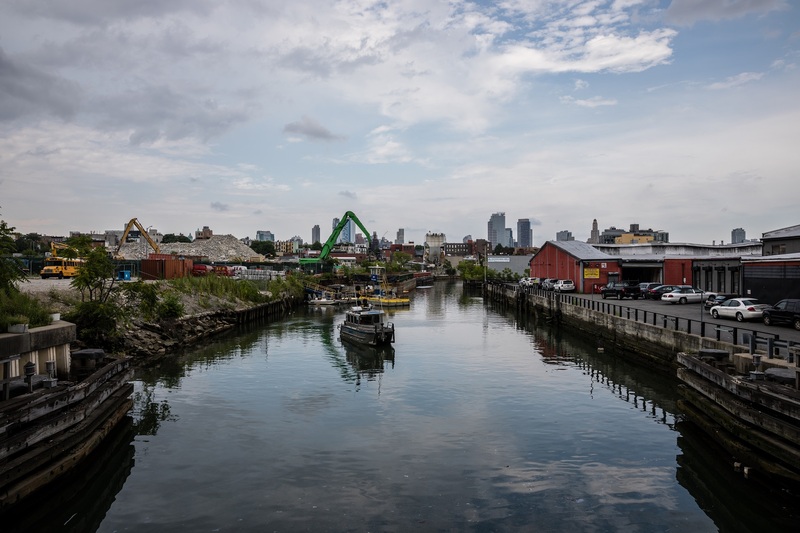 Gowanus Canal Project Manager Christos Tsiamis, a 25-plus-year EPA veteran, alerted Gowanus residents at a Community Advisory Group meeting in June that the remediation of the first bulkhead collapse was taking longer than usual. He said that the company tasked with delivering the construction materials was taking an abnormal amount of time. “We heard from the EPA last month about the last bulkhead collapse; that they’re still working with the engineers to establish exactly what went wrong and what led to it in the first place,” Dixon told the Eagle. “So there are more questions than answers at the moment. Will the Gowanus Canal become the Venice of Brooklyn?